The Rowley-led Government’s incompetence has destroyed years of hard work by the People’s Partnership Government in tertiary education. This, according to Political Leader of the United National Congress and Leader of the Opposition Kamla Persad-Bissessar, SC, MP. 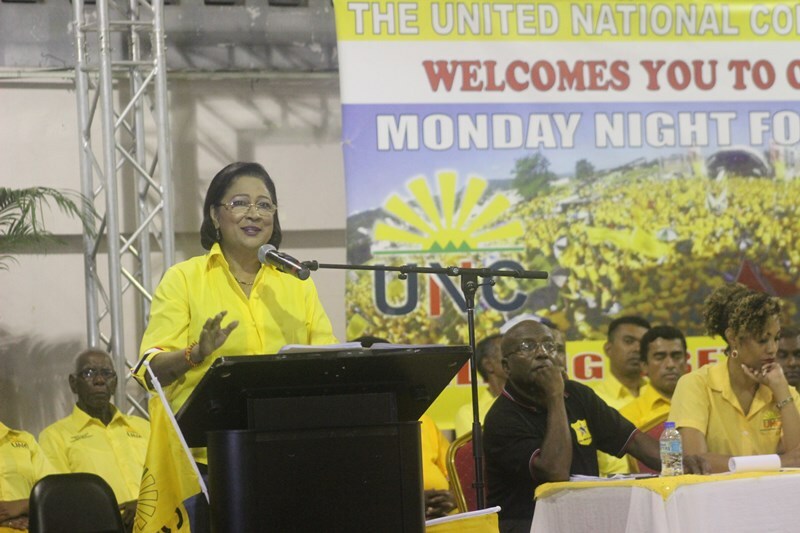 Speaking at the UNC’s Monday Night Forum at the Las Lomas Government Primary School on 24th July, 2017, Mrs Persad-Bissessar also waded into the Rowley regime over its mismanagement of the procurement of the ferries for the Trinidad and Tobago sea bridge, and on their continued inability to treat with the crime problem. Who was in Government in 2015? Not this wicked Government. We took that participation rate up to 65.23%. And they continued, “The targeted tertiary participation rate of at least 60% by 2015 has, therefore, been exceeded.” We set the target of 60 percent and we exceeded our own target. Now they want to roll it back, they want to take it away, they want to reduce it. They have to understand, that if you are to diversify a nation, you can’t just talk the pretty words, you have to diversify the skills sets, the education levels of our people. Our best resource is our human resource. Today I am appalled. I am incensed and I am angry. They are cutting the evening programmes for the BSc in Social Sciences. They are cutting it for the CPA – the Certificate in Public Administration. These are courses where people who were working could take these courses, but they are going to stop it. Fast forward to the “Red and Ready”, this wicked Government, and the enrolment has now dropped for 2016/2017 to 186 students. And as if that is not bad enough, they moved to amend the regulations to remove completely now, all evening students. What about all the people who have to work and study? Are they serious? They would disadvantage persons who want to improve themselves and therefore improve this country. In two years they have been in Government, they have managed to destroy the years of hard work by our Administration. We are seeing the reversal of the progress we made. We warned this Government that nothing good would come from closing the GATE. We warned them that investing in our human resources, in our PEOPLE, is the only way to secure our future. Instead they chose to tax us into oblivion. Were all these things in the GATE report? We have not seen this report. I want to say you should put us back in Government, I will guarantee that we will open the GATE for all the people of our country. And we heard about changes to the matriculation requirements – less qualifications to get into University. Why are you watering down the University? When we were in Government we were able to bring in more than 55,000 people into the tertiary education sector. Now they are saying you could come in with lesser qualifications. It means then that those who cannot afford to come, the numbers will be less. Maybe those who do not have the qualifications but the means to enter, they can apply. So if you’re rich, but you’re not bright, you do not have the qualifications, we will take you. But if your parents cannot afford it but have the qualifications, they cannot go to University. Donkey logic. It shows again that this Government is only concerned about the super elites and the 1 percent. I call on the Rowley government to stop governing for the 1% and govern for the whole of Trinidad and Tobago. We are paying $52 million more than when we had the Superfast Galicia. You know how much it would cost to put a student through tertiary education? About $15,000. And with that $52 million you could send 17,000 students to University. I received a notarized letter which states, “This is to certify that the MV Cabo Star, formerly named MV Antares, had to US firm indicated, through their London-based correspondent ship brokers a charter rate of US $15,000 per day for the charter service between Port of Spain and Tobago.” How much are we paying now? $22,500 US per day. With that additional $7,500, you multiply that for the year, and you will be able to send another 2500 students to University. So about 20,000 students could be covered with this money that they wasted on this boat the Cabo Star. I call on Minister Rohan Sinanan to tell the country who are the shareholders and directors of Bridgemanns? We can find no record in the Companies Registry of Trinidad and Tobago. How could a company not registered here be given this Charter by the Government of Trinidad and Tobago, with a name Bridgemanns Trinidad LPC? The Minister and the Chairman of the Port Authority must tell us if it is true that Bridgemanns Group of Canada came to Trinidad to offer technical advice to the Port in May and June of this year. In June they purchased two vessels, the Cabo Star and the Ocean Flower 2. So in May and June they came to give technical advice, and in June purchased these two vessels and charted them to the Port Authority. This is scandal of the highest order. No procurement process whatsoever. A company with no track record. This stinks of corruption. The Ocean Flower 2 was sold from its original owners on June 26, 2017. And a few days later in a charter party to lease it to Trinidad and Tobago. This boat the Ocean Flower 2 failed safety requirements as late as March 2017, and has an annual inspection due in August of this year. The Minister must explain the haste with which the contract was signed with the Bridgemanns Group and not with the operators of the Superfast Galicia. Why did they not sign a contract with the Superfast Galicia when it was costing less, carrying more, and doing the work? Where is the Honourable Prime Minister on this? Not a word on this sea bridge scandal from the Prime Minister. Every time the PNM is in power – murders increase. And as the graph shows – from the time the Rowley PNM has been in office – 871 murders in 686 days. To date this year – 267 and counting. This is the Rowley PNM. When we were in Government, crime was high on our priority, and we realized that the fight against crime had to be a holistic fight. This Prime Minister, Keith Rowley, believes that you can blame the Trinidad and Tobago Police Service (TTPS) and that is fine. He believes that it is only the TTPS that is responsible for dealing with crime, and I repeat the point I have made, that when the TTPS comes in – crime has already been committed. One of our MPs, Barry Padarath had his birthday celebration, with a prayer service – a three night Ramayan at his grandmother’s residence, and a bandit with a gun was sitting in the tent and held them up! Crime is something we don’t see as only being the remit of the police service as this Prime Minister seems to think. Our approach was holistic – legislative measures, non-legislative measures, infrastructural works and social and educational programmes. They are shutting down all programmes in the social safety net. They are taking away the programmes that would help poor people – those are part of the arsenal in the fight against crime. It was as a result of these programmes that we were able to bring down serious crimes to the lowest levels in 33 years. Rowley and his Government blame the police every time. They say they need a new Commissioner of Police, but we had the same Commissioner of Police and TTPS but we brought crime down to the lowest in 33 years. All of this is happening in our beloved country. What did we do in the fight against crime? We understood we had to look after our human resources. The Government which I led started payment of a non-taxable Special Allowance of $1000 to all serving officers of the Protective Services to increase morale. Under my government we made sure that the Protective Services were given the means to fight crime. I will just name a few of the things we did. 1. 2,000 Special Reserve Police Officers to work alongside regular police officers. 2. More than 500 vehicles were purchased for the police service and more than 11,000 vehicles were refurbished. 4. We undertook the acquisition of 4 Coastal Patrol Vessels and 2 Utility vessels for the Trinidad & Tobago Coast Guard. 5. The largest number of Coast Guard vessels ever approved in the history of the Defence Force, with approval being granted for 12 Damen Vessels and a naval patrol vessel from China which is the largest vessel ever acquired by the Coast Guard. 8. We established the Community Comfort patrols to ensure that you were safe in your communities. When you are most under threat the Rowley PNM has disbanded this. You will remember in the Budget we had said for our protective services – Police, Army, Prison and Fire Officers – if they die in the line of duty their families would receive 1 million dollars. Rowley continues to blame the TTPS but I want to say that he is responsible. You are in charge, you have to deal with it! There was a Law passed in 1996 by a United National Congress government – the Protective Services (Compensation) Act. This was a Law that provided for compensation to be paid to the families of all members of the Protective Services when they died or when they were injured on duty. This was to ensure that the families of those who had died and members of the protective services themselves when injured would be able to apply to the Protective Services Compensation Committee set up under this legislation so that they would be able to look after themselves. Last week I discovered that for the past two years this wicked government and this Cabinet led by Dr. Rowley has not appointed members of this Committee and so all Police Officers, Prison Officers and Fire Officers are presently unable to access this Committee to make applications for compensation and to receive compensation. And what is even more heart-breaking is that if you are injured, there is a limitation of one year to apply for compensation. That is wickedness and negligence of the highest order. There was one particular case of a former police officer who injured his spine when he fell on the job and made an application for compensation to the Committee. His case went all the way to the Privy Council before he was successful. The Privy Council made an order for his claim to be assessed by the Compensation Committee since August 2015 and for the past 2 years the Attorney General has been in breach of that order. That is the level of unlawfulness of this Rowley government and the Cabinet led by this Prime Minister. In the case of this former officer, Fazal Ghany, because he was not able to access this committee to get his compensation, he had to take his child out of university because he could not afford to pay the rent. That is the level of suffering that our citizens are made to endure under this Rowley regime. Can you imagine for two years they are in government, red and ready and they can’t simply appoint the Committee? And they tell us they in charge and we must deal with it. Well tonight I want to tell the PNM, Dr. Rowley and the Attorney General we in the UNC and I myself as leader of this Opposition are prepared to deal with it. As of this morning I have filed proceedings against the government of Trinidad and Tobago through the office of the Attorney General for Mr. Fazal Ghany. I am going to prosecute this claim myself before the Courts to ensure that Mr. Ghany gets justice and to ensure the unlawfulness that the citizens of this country are suffering under this Rowley government and more so the members of the protective services stops. Today this unlawfulness must stop. We are going to seek from the Court a declaration that the failure of the State, particularly the Cabinet of the Government of Trinidad and Tobago to appoint a Compensation Committee amounts to a breach of his fundamental rights guaranteed under Sections 4 and 5 of our Constitution. We are seeking further a declaration that their failure to comply with a judgment of the Judicial Committee of the Privy Council amounts to a breach of the fundamental rights of Mr. Ghany. We have asked the Court for an Order directing the Cabinet of the Republic of Trinidad and Tobago to forthwith recommend to His Excellency the President the names of the persons to be appointed to the Committee and claiming damages, interests and costs. We will fight for all of them and all of the citizens of this country. We will fight this Rowley regime in and out of the Courts.